Laos. Once a forgotten remnant of the old French empire, later an impotent neighbour as North Vietnam poured troops through its eastern provinces along the Ho Chi Minh Trail into South Vietnam. As a result of this trespass, the US Air Force dropped more bombs on this thin slice of neutral territory than any other place on the planet. Both North Vietnam and the USA caring nothing for the integrity of a small Buddhist society surrounded by China, Vietnam, Cambodia, Thailand, and Myanmar. Once the Vietnam War was over, this beautiful tragic land descended into a maelstrom of home-grown violence – a surprisingly brutal civil war which was eventually won by Russian backed communists, the Pathet-Lao. Quite a combination. Peaceful people and a sad history of violence. Tragically highlighted today by unexploded ordnance which continues to kill and maim subsistence farmers in the eastern provinces. The poorest places of all. Nowadays Laos is a must-see destination on the Asian backpacker trail. Folk who come here because of the natural beauty of the people and the landscape, and the sense of Buddhist calm which pervades this isolated and charming little place. More an enclave than a country. 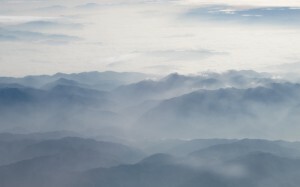 And here I am, flying south from Yunnan province in China across northern Laos to the Capital, Vientiane. Looking down. A brown-yellow Mekong River snaking its way through the green of high mountains and thick jungle. 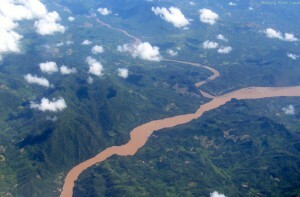 River valleys carrying smaller streams emptying into this larger artery which has its source in the Tibetan Plateau and its terminus in southern Vietnam. 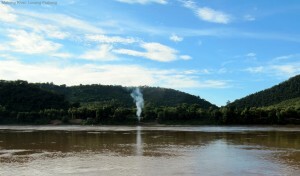 The lifeline of Laos. Evidence of a slash and burn economy below. Occasional villages lost in the past. Connected by river traffic or a rough dirt road skirting the spurs, gullys, and hills of this impenetrable little backwater. 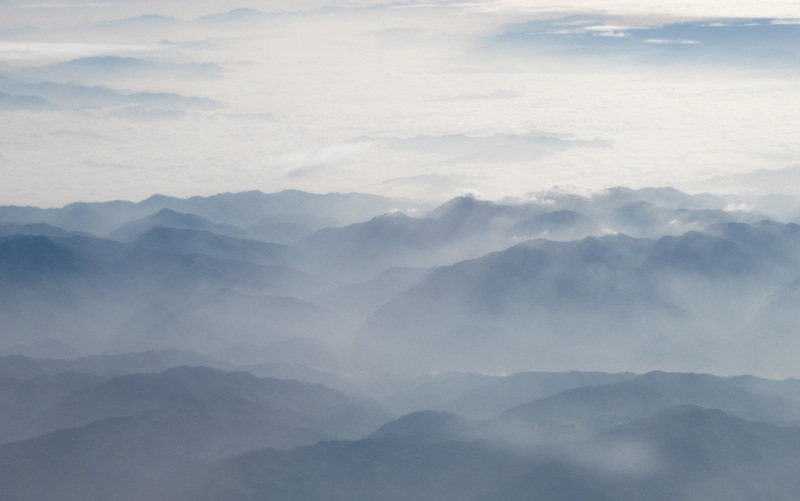 Spectacularly beautiful to look at from above, but so difficult to traverse on the ground. A long way from nowhere. The countryside flattens as we near Vientiane. Some organised agriculture. Yellow dirt roads which look like they are going somewhere. Better looking housing. Bicycles, tuktuks (three wheeled motorcycle transport for a handful of locals), and pedestrians carrying baskets suspended from a sapling across the shoulders. Everybody on a road together. Going somewhere in the local economy. Vientiane is probably the sleepiest, laid-back capital to be found on God’s earth. 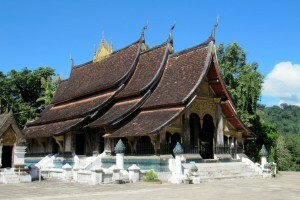 A blend of once gracious old French architecture and freshly-painted Laotian wats (temples). Orderly traffic (compared to where I live in China), and a sense of unhurried we’ll get there when we get there routine. Big european saloons demanding right of way over the proletariat on their pushbikes and scooters and tuktuks. Where are the elephants when you need them? Backpacking squats in mouldy old French digs, tarted up with pastel colours and lots of signage. Cosy restaurants and street-side cafes. Western food. Pale-faced European couples just off the plane and sunbrowned expatriates and their local girlfriends mixing it on the street. A comfortable, relaxing setting. A good place to stay and catch your travelling breath for a few days. Baguettes, good Lao coffee, and cheap laundry services. Beer Lao is good also. 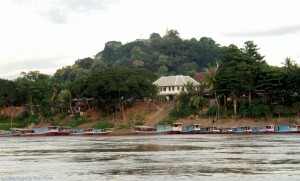 Then a local flight from Vientiane to the ancient capital Luang Prabang to the north. One day by twisting road, and less than one hour by twin-engined turbo-prop aircraft. A great way to fly. 18,000 feet. Low enough to enjoy the view. Flying through a mountain pass beside the Mekong and landing just a few short kilometres away from this world-heritage listed wonder. It’s a beautiful place. 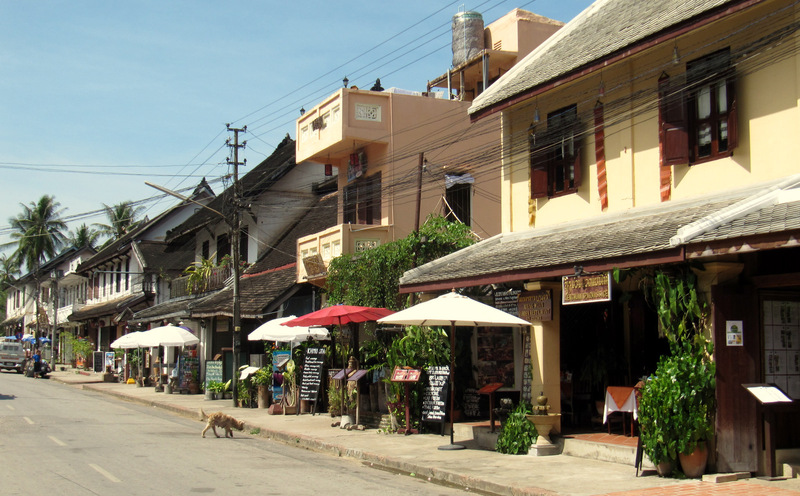 A balanced mix of crumbly French buildings and ancient Lao culture. Wats (temples, remember?) everywhere. Some looking spectacular in their red rooves and golden yellow walls. Inside, fresh coats of shiny gold and black trimming. Unique rooflines. Others, like the ancient Wat Xieng Thong, looking dignified and majestic in their slightly weather-beaten appearance. A consequence of carrying such a weight of history no doubt. 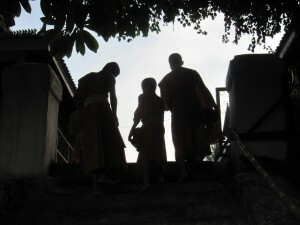 Luang Prabang is cool. In both senses of the meaning. But the overriding feeling is knowing how lucky one is to be here now. The old town is reserved for bicycles and small vehicles only. This cultural environment is well-protected from tourism’s excesses. It’s a great place to hang out for a week or so. 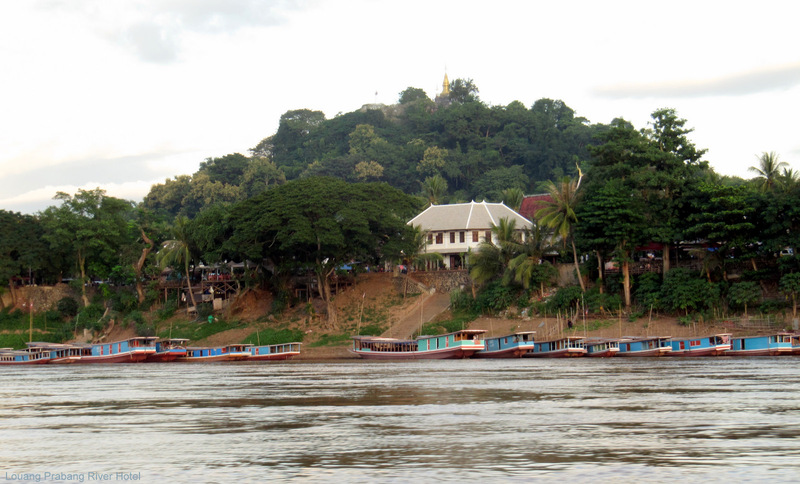 River transport is the way to go, and there are plenty of shallow-draft longboats to take you to various cultural and natural wonders upstream or downstream. Take a sunset ride and photograph a golden ball reflecting across this famous river as it sinks into neighbouring Thailand. And enjoy the people. They haven’t been polluted yet either. Quiet and shy. Unhurried and dignified. 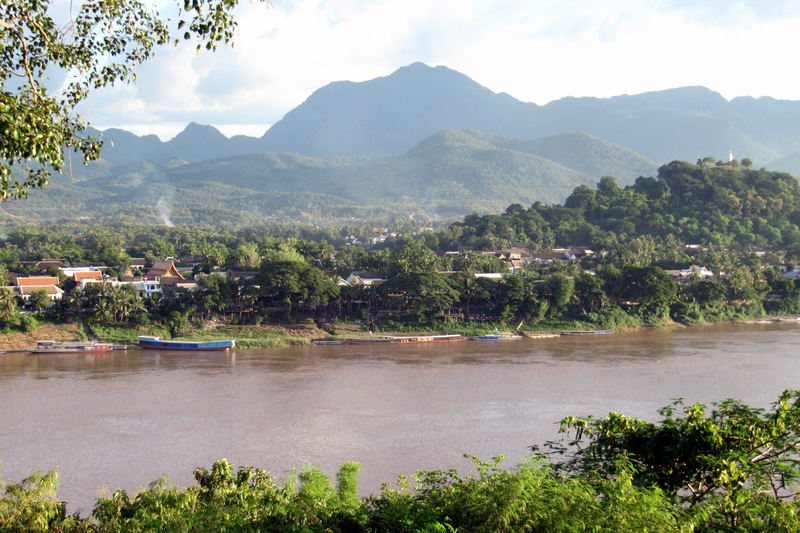 Comprising many ethnic groups, the most notable being native Lao and hill-tribe Hmong. Softly spoken representatives of a matriarchal society. The soul is real. Buddhism, a spirit world interpretation of reality, and sense of, ‘they are who they are, and they know who they are’ approach to life. Family is everything. Home, anchor, and refuge. The source of one’s identity. States may come and go, but family is forever. Even after death. Laos is the kind of place one should enjoy for awhile rather than gawk and go. It’s a culture rather than a country. It will change the way you look at things.